VIDELIO-Events + Utram and Riedel Communications' MediorNet real-time media network helped bring the action from Roland-Garros tennis tournament to large-screen displays across courts at the stadium in Paris, as well as to the internal IPTV distribution network supporting the tournament. VIDELIO-Events + Utram and Riedel Communications’ MediorNet real-time media network helped bring the action from French Open tennis tournament to large-screen displays across courts at the Roland-Garros stadium in Paris, as well as to the internal IPTV distribution network supporting the tournament. “Supporting fibre signal transport for 3G/HD/SD-SDI video, audio, data, and intercom signals, and providing a 50Gbps network bandwidth that enables high-capacity signal transport, this solution is ideal for streamlining infrastructure for world-class live sports events such as Roland Garros,” added Fredéric Redondo, director of Pôle TV and sports events at VIDELIO-Events + Utram. 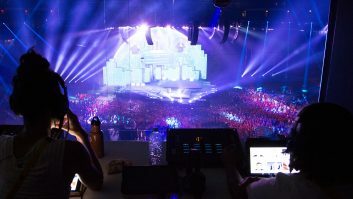 For the 2015 tournament, three Riedel MediorNet Compact Pro frames were deployed by VIDELIO in an optical fibre ring linking the outside broadcast area, the special TV control room dedicated to large-screen production during the tournament, and the FFT video control room at Philippe Chatrier court. The ring was established using one permanent fibre and two additional fibres deployed specifically for the event. In addition to facilitating real-time distribution of video to video screens and the IPTV network, the Riedel solution provided processing features, such as embedding/de-embedding, that were used widely to simplify the process of transporting various audio channels within the associated video signals to feed the stadium’s loudspeakers.